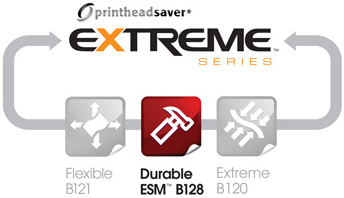 B128 Durable ESM™ wax/resin is formulated for flat head technology printers and provides super-sharp imprints and clean edge definition. B128 is a logical choice for applications where extra durability of the printed image is required, as it is UV-resistant and offers strong abrasion and environmental resistance. This multi-purpose wax/resin also features medium/high label flexibility, medium print energy, high scratch and abrasion resistance, and medium resistance to common agents. CLICK HERE to view the B128 Durable ESM™ data sheet.